Do the numbers matter or is safety still trumped by cars, parking, and attitudes? Are the number of cyclists on Harbord and Bloor high enough to justify a bike lane on both streets? Are too many single-occupant cars still taking up too much precious downtown road space? Are cycling numbers on Bloor sufficient to justify the reduction of on-street parking? New numbers from our May 17, 2017 bike (and related) counts provide strong evidence for answering each question with “yes.” The numbers may help the cause of Bloor cyclists but as Toronto cyclists know, their safety, regardless of their numbers, isn’t usually enough to motivate city decision-makers to act in their favour. It’s unclear how many cyclists have to be on Bloor for city councillors to make the bike lane permanent. The city now claims to (really) care about the safety of vulnerable road users like cyclists but there are lots of things some councillors care about much more, including the apparent right to drive solo into the downtown and to park in front of a store on Bloor. And when it comes to attitudes, cyclists continue to fight uphill battles against motorists who look down on them from a high moral ground. On Wednesday, May 17, we dispatched a group of 30 volunteers, armed with clipboards, to count things that we hope will matter when a decision on the pilot bike lane is made later this year. In the morning 7-10 a.m. rush hour we documented a combined total of 2,318 cyclists on the Bloor and Harbord bike lanes at Spadina Rd. 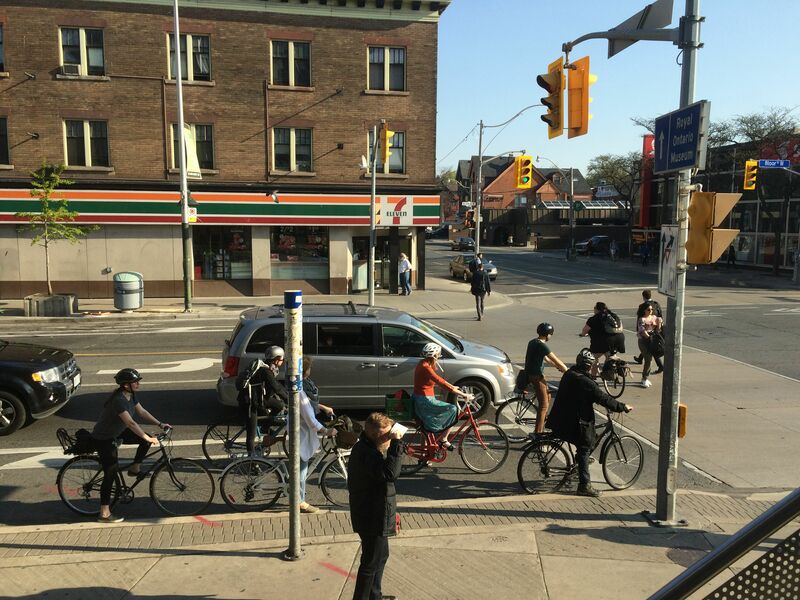 During the busiest 8-9 a.m. period alone, there were 611 cyclists in the Bloor bike lane and 513 on the Harbord one. Over the 24-hour period, 5,515 cyclists travelled along the Bloor bike lane at Spadina. In fact, based on our September 2016 count, it may now be fair to suggest that 5,000 to 6,000-plus cyclists over the course of a warm, sunny day is the new normal for bikes on Bloor. (The city’s own count confirmed the high daily cycling numbers on Bloor, albeit somewhat less at 4,500 cyclists -- presumably the result of different weather conditions during the count, which was conducted in late October and early November). In the 7-10 a.m. rush hour period on Bloor, 80% of the passenger cars contained but a single occupant, namely the driver. At one of the small number of locations in Toronto where bike lanes intersect, at Bloor and Shaw (at least while the bike lane on Bloor is in place), we counted 1,487 cyclists travelling through the intersection from 7-10 a.m.
And on a local side-street, Barton, which runs parallel to Bloor (and that’s suspected of being used by some commuters to by-pass Bloor) motorists’ conduct fell short of what neighbours might expect. During the 7-8 a.m. hour, only 26% of motorists came to a stop at or near the stop signs at the intersection with Albany Ave. When all forms of traffic (motor, bike, and foot) increased from 8-9 a.m., motorists’ compliance with the stop sign actually fell to a mere 14%. Whatever the numbers, the greatest challenge for cyclists might well be to convince decision-makers --- and even some of the merchants in whose stores they shop --- that their safety is more valuable than the on-street parking spots that have been removed from Bloor. A complaint we’ve heard from some merchants is that their customers aren’t willing to walk from parking lots behind their stores (especially in the Bathurst to Christie Streets area) to the front door of their store. And it goes without saying that these customers think they must drive, despite the fact that the Annex and Koreatown areas are served by the city’s best transit, which during peak shopping times has ample capacity. One irony, among others, is that for all the love that parking spots get, the city continues to give it away for free, or close to free. During the day, parking on most side-streets in the area is free. That’s hardly an optimal way to distribute a key public resource -- land. And in the parking lots above the subway between Bathurst and Christie, a parking spot (measuring 330 square feet) rents for $8 for the entire 7 a.m. to 6 p.m. period – 73 pennies per hour. That’s a great deal in a city, and a neighbourhood, where people can’t find an affordable place to live. And even on Bloor, where space is apparently so precious that some people are willing to sacrifice cyclists’ safety, a motorist can still park a car for three full hours for a mere $6. 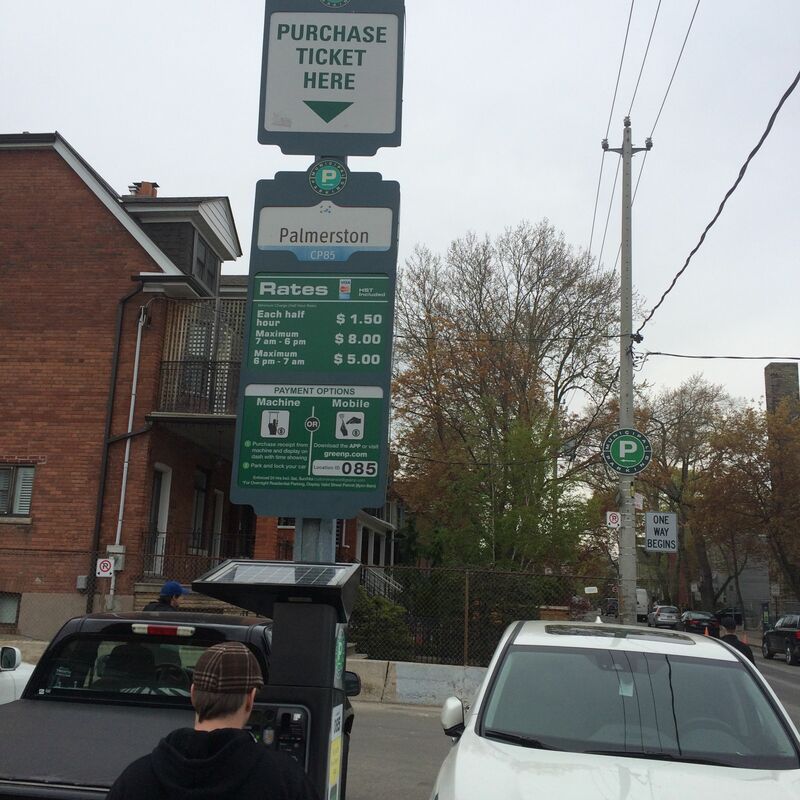 It isn’t just the cost of parking on Bloor that should raise concerns. These parked cars, especially SUVs, pose a danger to pedestrians because they obscure sightlines. The Bloor St. bike lane will be a valuable test for Toronto. We will find out what numbers --- and what values --- actually matter. And we will find out if City Hall’s new interest in the safety of vulnerable road users is sincere or if single-occupant cars, old attitudes, and even parking spots still trump safety. Vision Zero - but no love for Bloor? How about a study on how the patrons of Bloor St businesses are actually arriving at their destination? There’s always an assumption that they must have driven there. One of the conveniences I love about biking is that it makes it super easy for me to stop and run errands aka SPENDING MONEY IN LOCAL BUSINESSES. The Toronto Centre for Active Transportation did precisely such a study in 2009. Their finding … only 10% of customers arrive by car, while merchants consistently over-estimate the contribution of motorists to their businesses.